#AtoZ 2016 - EXceptional Yellow Miniatures! Today is the Letter Y - for the 7th annual A to Z Blog Challenge in April! Check out the 1000+ blogs on the list! If you like books, etc., I'm also doing the same on my GirlZombieAuthors blog. This is my favorite color and once I saw the latest gorgeous work by fantastic miniaturist Linda Cummings of Lins's Minis, I knew what I had to feature today! 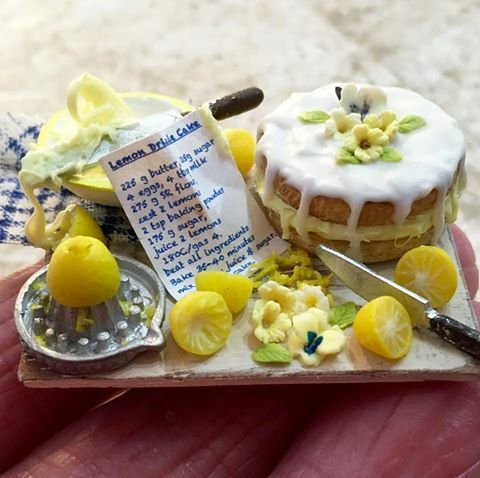 Linda's minature work (1" scale, 1" equals 1 foot) is so precise and realistic, I'll bet your mouth will be watering! Also check out her Facebook page. See more of her work and a previous post I wrote about her here. Check her Etsy shop (http://www.etsy.com/shop/linsminis/) or see her website,www.linsminis.com. You can see more of her work on her Pinterest page. Welcome to the 7th annual A to Z Blog Challenge in April! Come back daily for more exciting posts and even some giveaways! Check out the 1000+ blogs on the list! If you're never seen The White House in Miniature, you've missed something. I've heard it may not be touring again, but it is housed at the Presidents Hall of Fame, Clermont, FL. There are a series of great photos here at the Ford Presidential Library site. Today, I combined the letters U and V for the Upstairs View of the Tudor Dollhouse. * See first floor - the bakery. The living quarters: The walls are covered with textured paper. The ceiling is textured with paint mixed with sand before the wood beam strips were added. The bed is also made from the Creatology punch-out furniture kit (1/24 scale) from Michael's. The small table by the couch is also a magnet from China (eBay purchase) from my friend, Gigi. TIP: Make the pieces look more finished by cutting off any protruding tabs. Fill holes and spaces with wood filler and sand. I painted it with a watered-down Brown Umber acrylic paint. The bed is covered in three layers like a real bed. 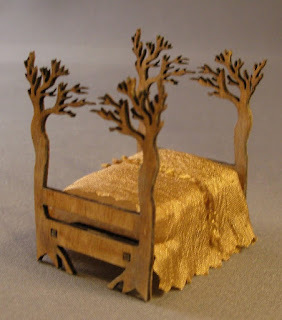 Glue a thin piece of foam onto cardboard cut to fit the bed. Cover that with one fabric pattern, folding fabric over and gluing to underside of cardboard for a mattress. Cut and fit a second fabric to top of bed and overhanging sides for a bedspread. Glue under small hems for a neat finish. Cut a fake sheet by gluing a piece of fabric to underside of top bedspread, then turn over and glue to top of bedspread. I made the couch using the pattern in D. Anne Ruff 's older 1/24 scale furniture pattern kit. The small club chair is one of those packaged erasers found at Michael's. Measure your fabric and glue to cover the back and seat of chair. 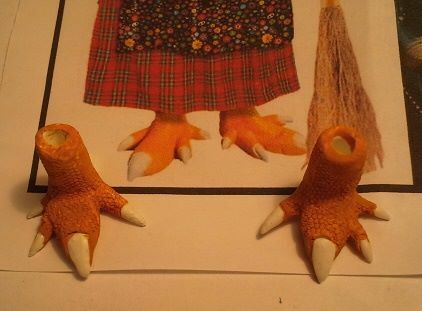 Add smaller size pony beads on bottom for feet. I added a beam across the top and used a metal mesh bead as a lamp shade for the ceiling light. I had to be a little creative since I hadn't planned the lighting. The sides are covered in a plain pink paper so I could peel it up to reattach the side light and then cover it again. The window valance is made by pleating a piece of fabric, folding and gluing it so one end is pleated over the next. It's glued to a wood strip with small pony beads at the ends. The picture frames are painted chipboard pieces. The wall clock is a small charm. I wanted the room to have a simple, but homey feel. Nothing too fancy, just something clean and neat that the bakery owner would feel comfortable in. It's a simple house, but still fun to decorate. The table was made by gluing a small round piece of wood to a dowel rod and painted. That was glued to a small flat clay piece for a base. The chairs are vintage plastic dollhouse pieces. I started this house a while back and then put it aside. Originally, it was going to be a greenhouse, but I decided to make it into a bakery and upstairs living space instead. I bought the house a loooong time ago at a show. So, some projects do sit around a while until inspiration hits. The bakery case is made from a bookshelf with acrylic plastic glued in front and a larger wood piece glued on top for the counter. Cover front edges, top and bottom of the plastic with wood strips (coffee stirrers.) The stove is a magnet. My friend Kitty Balke made most of the cakes and desserts. A few cakes are from the annual Half Scale Yahoo group swap. I made the brown and yellow cake on the back shelf from wood furniture plugs. Paint and cover with colored sand. I use dimensional or "puff" paint on top for icing. Add small fruit slice. Glue to a small button for a plate. Most of the square and round plates, including the plate for the mixed pastries on the counter, are buttons. Left side: The cabinet (below left) is a kit from Petite Properties (UK). I made the table from a round piece of mat board cut out and sanded. The base is a chess pawn, cut, sanded and glued to painted table top. The chair is made from the punch-out Creatology 1/24 scale, punch-out furniture kits from Michael's. Right side: Counter with cupcake art on right wall is made from a box shape and piece of wood for the top. The table is also hand made. The round center table was a purchased resin piece; I added the wood on top. The chair is also from the punch-out furniture kit, with an added seat cushion. The rug is a paper print-out coated with Mod Podge, with fringe added to the ends. I like to do it this way to give the rug a floor-cloth look. Fringe a Rug: Everyone has their own method. An easy way to do it by measuring a piece of cross-stitch fabric to the width of the rug. Cut it to about four-to six rows deep, enough to give you a few rows to glue on the back of the rug and to have several rows sticking out on the end. Glue to back of rug with Tacky glue. Pull the strings to desired length for fringe. You can trim the fringe down if you think it sticks out too far. For an extra "glam" look, lightly coat the fringe ends with a metallic gold paint. * Come back tomorrow to see the second floor. HOW TO: 1. Scribe lines into a piece of wood cut to size for the door. It fits into the open space and above a piece of wood set into the floor for the jamb. Cut wood strips for top and bottom, and glue to face of door to provide something for the hinge pins to grab onto. 2. I cut hinges out of the tin from the top of a peanuts can with scissors. NOTE: Measure hinge to fit across door on side and attach to wall under the doorway frame. 3. Cut hinge into an arrow shape. Drill small holes into the wood strips with a small hand drill. Line up hinge and push hole into the tin. Coat back of hinge with Quik Grip to door and to edge of doorway so it fits under the frame. 5. Gripping pin with pliers, dab end into Quik Grip then push it into the hole in the hinge. Push down on top of pin with a hammer or flat side of the pliers until it's all the way in place. do the same to the end of the hinge to hold it in place. 6. Measure your side door frame piece. Press the wood piece onto the wall and over the hinge so you get an indent on the back side from the pin. Gouge out this space slightly so the frame fits flush to the wall, then glue in place. Once measured, your door frame will be glued over the hinge. The door can be opened - carefully - but excess stress may pull the pins out. Some of the stuff I found at the Spring Chicago-area dollhouse shows this past weekend. I will also try to share photos of some of the interesting exhibits and items I saw. Today is the Letters Q and R for the 7th annual A to Z Blog Challenge in April! If you're new to the hobby, or have never seen the following places and exhibits, be sure to put them on your next travel schedules! There are some Quite cool places to see on the Road! 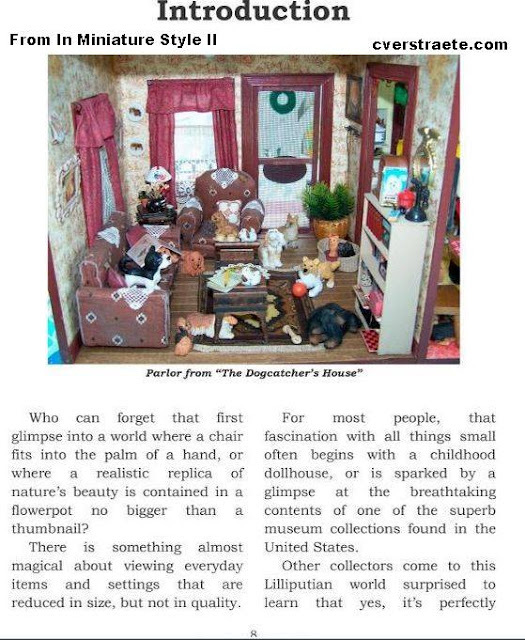 Miniatures Museum of St. Louis - they have a virtual museum tour, too on their website! Open since 1993, the museum contains a collection of over 600 houses, roomboxes and more. Cool! Take a virtual tour on Google Maps. Got these kits coming from Michelle's Minatures (she didn't have them on hand at the 3 Blind Mice Show so she's shipping them.) I fell in love! She has such unique kits! 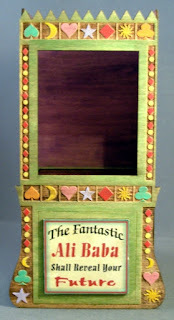 This half scale fortune teller booth is so cool! Also got the cute cigar box purse kit. Here are some of the interesting items I saw (and couldn't or didn't buy) at the Spring Chicago-area dollhouse shows this past weekend. 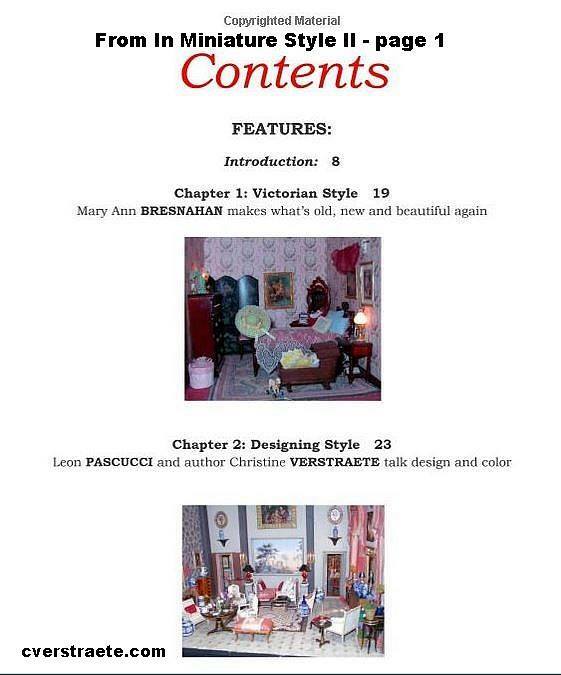 I'm cheating a bit today as I'm featuring Camille Minichino, (writing as Margaret Grace), author of my favorite mysteries about dollhouses and miniatures, on my other blog. Be sure to go read her post and comment there to enter her giveaway! Hard to believe she's written eight books in the series, the latest being Manhattan in Miniature. 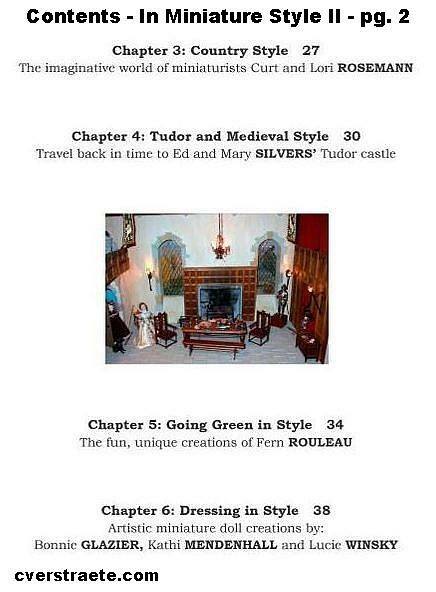 * See all the books at her website or her Amazon page. #AtoZ 2016 - I Just Love Minis & #Mysteries + Know You will too! Today is the Letter I and J for the 7th annual A to Z Blog Challenge in April! And K-L - I love minis - and Know you'll love this, too! Cheating just a bit today. I'll have a mini mystery coming out soon involving my two favorite things - miniatures and writing short stories! What's more fun, right???? I had a blast writing this story featuring my part-zombie girl character, Becca from GIRL Z: My Life as a Teenage Zombie. 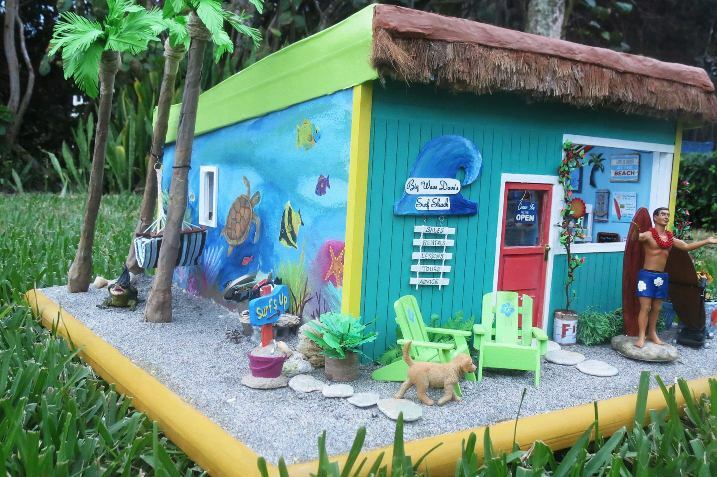 This times she's solving a little mystery involving miniatures based on friend and fellow writer Joanna Campbell Slan's Big Wave Dave's Surf Shop. Joanna's cool project took honorable mention in the annual Miniatures. Com contest this year! See all the contest pix here. See more of Joanna's project on her Facebook page. Today is the Letter H - for the 7th annual A to Z Blog Challenge in April! I love working in half scale (1/24 scale - 1/2 inch = 1 foot). The best part is the annual anniversary swap by members of the Half Scale Yahoo Group. I've been in it at least 7-8 years, I think. This year there were over 30 members. There have been over 60 members in the past. It always amazes what people make. 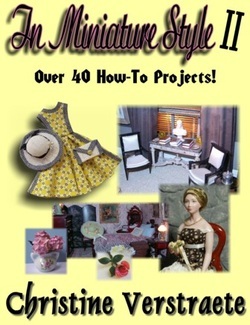 I have a box full of items to use in my dollhouse projects and get ideas for things to try making myself, too. Yes those are eyeglasses above! Was thrilled to get a computer model! I'm going to try making a white wood with a wood case. The tiny dotted bead is a crock pot! The white straw sewing basket even has teensy sewing items! Today is the Letter G for the A to Z Blog Challenge. Shared this on my other blog at a later date, so figured I'd share it here, too. A secret. Shhh! I am working on some other projects. Details to come soon! ** CONTEST: Sign up for my mailing list on the main website page - get entered to win the yellow and black check material to make the cover dress! (US shipping only.) Comment below that you signed up. Today is the Letter F - for the 7th annual A to Z Blog Challenge in April! Sunflowers and Hibiscus... More to come. #AtoZ 2016 - E for Everything #Miniature! Today is the Letter E for the 7th annual A to Z Blog Challenge in April! I used to draw and do other crafts like cross-stitch, but I've since concentrated all my crafting efforts on miniatures and dollhouses. This still allows me to make a variety of things or try different crafts. I've cross-stitched and made Bunka rugs... I've made fabric curtains... I've made different accessories. I'm a DIYer - I like making things or trying to. And yes, I buy stuff I like or realize I don't have to make! See some of my projects at my website or look through this blog, too. For fun and as my profession, I also like to write. I do nonfiction -- newspaper and magazine articles -- as my main job. I write fiction as another creative outlet. A little hint: I will have another mini mystery story coming out soon featuring my Girl Zombie book character, Becca. This time she's helping solve a murder --- and it has miniatures in it! Some may also recognize a friend's project in the story. Stay tuned for more details soon!! Sooner than you think! 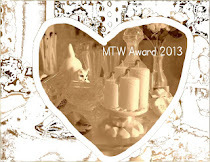 ** CONTEST: Please sign up for my sporadic newsletter on my website. 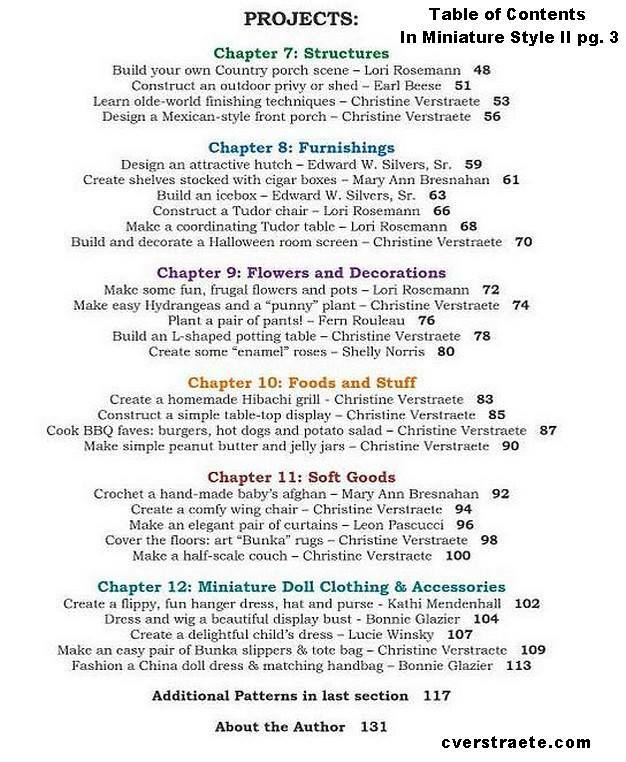 * Sign up and get your name entered to win a Kindle copy of my first miniatures book, IN MINIATURE STYLE or a PDF of my second expanded version, IN MINIATURE STYLE II. See minis page for all links. Comment here that you signed up - be sure to leave an email to contact you. Today is Day 4- the Letter D - for the 7th annual A to Z Blog Challenge in April! If you're a new visitor, I wanted to share a little about me. I'm a writer, journalist and collector. You can see more of my miniatures on the blog here or go to my website. Oh, and check out this previous post to see the actual mini oil painting of Starry Night by Lucie Winsky! Today is Day 3 - the Letter C - for the 7th annual A to Z Blog Challenge in April! Color a dollhouse at SheKnows. - Assorted subject coloring pages. Color a dollhouse and change the text. 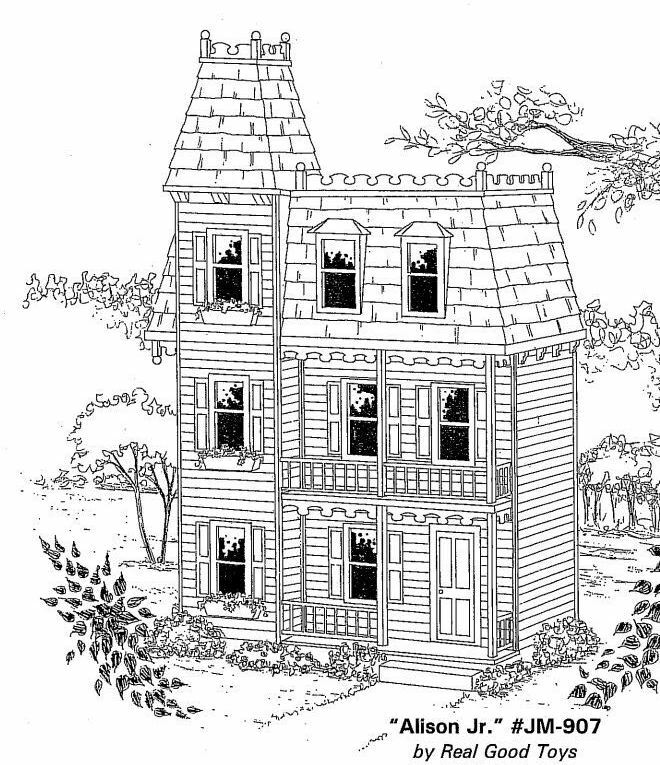 * TIP: Put the words dollhouse coloring pages in the Google search box and you'll get a bunch of pictures to color. Have fun! Today is day 2, the letter B for the 7th annual A to Z Blog Challenge in April! 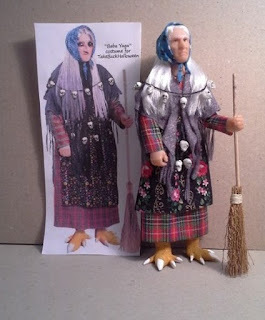 If you don't know who - or what - Baba Yaga is, I wanted to share a unique miniature project made by talented miniaturist Alice Zinn. I thought this was incredible and so realistic - a mini Baba Yaga, (1" scale, 1" =1', 6 inches tall) - accurate down to the feet! Now I'd heard of the Russian "witch woman" before, but never saw her with chicken feet until I looked it up. Pretty amazing, huh? A Mini A Day 2016 - #AtoZ Blog Challenge Begins! Today is Day 1 - the Letter A - for the 7th annual A to Z Blog Challenge in April! The idea is to blog daily (except Sunday) from A to Z. So expect lots of minis, maybe a few guests, maybe even a giveaway or two - you never know! Now I may repeat a pic here and there that I've shown before but there'll be a lot of new visitors this month, so bear with me! Don't be put off by today's plain, boring photos. It'll all make sense soon and yes, I'll include the "real " miniature projects. If you don't know what this is... it's a bit of the things that us collectors save or have on hand to use in that next project. These containers hold some of the mini gifts I got this past Christmas from my two collecting friends, Gigi and Kitty. I'll show some of the items along the way. This basket has items I'll be using in other projects. That pink item is a neat woven paper basket made by Alice Zinn that I won a while ago. It'll probably go in one of the Ladies Shoppe projects. Be sure to come on back for the rest of the daily mini tour!